Episode 41 – IBM, eMetrics, and more with Lee Isensee | Beyond Web Analytics! Join Lee Isensee and the Beyond Web Analytics team as they talk about the recent acquisitions of Unica and Coremetrics by IBM. The conversation dives into who is stealing the sheets in the relationship, to the current happenings within the Web Analytic Association, and more fun as the team talks about the upcoming eMetrics and the big gala! So download this podcast to your favorite mobile device or listen to the podcast here! If you have any comments or questions for the podcast, please use the comment section below. An experienced marketing leader with proven success managing and devising the strategy, planning and execution of enterprise level projects with a broad history of educating and advising people as well as organizations across a wide spectrum of industries. With 15 years in online delivery, ecommerce, and analytics, Lee is a highly regarded marketing analytics expert that has experienced the sometimes painful, and often successful, ventures of the evolving internet. Lee has played a key role in ensuring solid strategy and design for hundreds of marketing organizations globally, including several Fortune 500 organizations. His expertise ranges from traditional web analytics, such as customer attrition measurement, to conversion optimization. Lee is also well rounded in multi-channel solutions like enterprise data warehouse integrations between online and offline information to create a holistic solution. 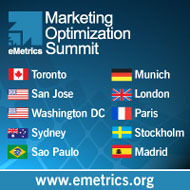 This article was posted in Podcasts, Web Analytics and tagged eMetrics, Lee Isensee. Bookmark the permalink. Follow comments with the RSS feed for this post.Post a Comment or leave a trackback: Trackback URL.